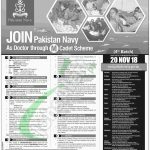 Apply for Join Pak Navy as Doctor Through M Cadet Scheme 2018 Online Registration - joinpaknavy.gov.pk. A 4th Batch for to Join Navy as Doctor (Male & Female) through Medical Cadet Scheme is announced today, according to which candidates studying in 4th & 5th year of MBBS in Government Medical Colleges/Medical Colleges recognized by PM& DC are welcome to apply through our site www.JobsAlert.pk because we provide you the best opportunities at our site before any other job portal of Pakistan. As it is cleared from the above that this opportunity is only for the Medical Students but those who are just Matric / Intermediate pass can apply for Sailor (S) Batch B-2018 and PN Cadet 2018-B which is also announced recently in October 2018. So, in the following we’ll discuss the requirements for the M Cadet Scheme 2018 and every candidate should read it carefully and apply accordingly as soon as possible because Doctor jobs in Pak Navy through Medical Cadet Scheme announce once in a year and if you miss this chance then you have to wait a year to apply again for this scheme in Pak Navy. Gender: Both male and females are eligible to apply. Nationality: The nationality holders of Pakistan/Azad Kashmir and Gilgit Baltistan are welcome to apply. Height: Male should be 5' Feet & 4" Inches for Male and for Female should be 5' Feet. Weight: Weight should be as per mass body index. Marital Status: Unmarried Male/Females are welcome to apply. Candidates studying in 4th & 5th Batch year of MBBS in Govt Medical Colleges / Medical Colleges recognized by PMDC as on 1st July 2019 are eligible to apply. 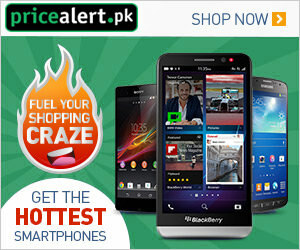 Interested candidates who wish to apply may register themselves from the website namely http://www.joinpaknavy.gov.pk. The Registration has started from 11th November 2018 and remains to continue till 20th November 2018. The candidates who have done online registration have to bring the Postal Order of Rs.300/ Crossed in the name of Director NHQ Islamabad. The last date for registration is November 20, 2018. Applications sent directly to the Naval Headquarter will not be entertained. Entrance Test will be done on 22nd November 2018 comprises E-Testing / Computer Based test will be conducted in Intelligence Test and Academic Test. The result would be intimated to each individual on completion of E-Testing. The candidates must get their ears and teeth cleaned by the special doctor. Personality Test will be held at PNR & SC. Final Medical Examination of shortlisted applicants will be held on Nearest CMH/Naval Hospital. Conduct of PN Selection Board at Venues decided by NHQ and Final selection will be done on merit basis by Naval Headquarters. Above we discuss Join Pak Navy as Doctor 2018 which is the 4th Batch of M Cadet Scheme 2018 announced for the Unmarried Male & Female individuals who are studying in 4th and 5th year of MBBS. So, candidates from Pakistan, Azad Kashmir, Gilgit-Baltistan are welcome to apply online at www.joinpaknavy.gov.pk before the closing date. Last Date For Registration: November 20, 2018. Address: Naval Nearest Selection Centers.